It was such a still-calm night tonight that I wrestled the telescope into the yard to point it up at the nearly full moon (full tomorrow night). After exploring its pock-marked plains for a while, I decided to try a bit of astro-photography for a laugh with my cheap digital camera ($150 point-and-shoot) by putting it up to the eye piece. I was actually really surprised by the results…much more detail than I imagined would be possible. 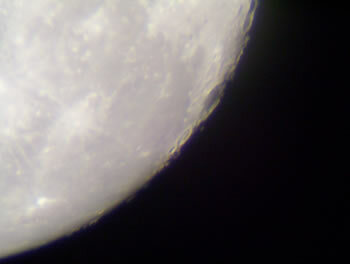 There be craters on my photo!